The fire wreathed horror that is a Red Dragon enraged shines gloriously in this SoundSet. 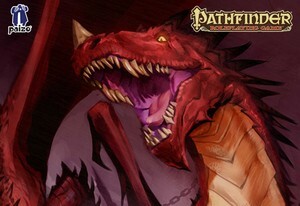 Thunderous roars shatter the peace of this deep cavern and powerful bursts of fire threaten to turn your flesh to ash. Take cover! The Red Dragon has arrived! This is a breakout SoundSet from the Pathfinder Adventure Path SoundPack. If you are a subscriber you will automatically gain ownership of this SoundSet. "Red Dragon Underground" is very similar to its companion SoundSet "Red Dragon City Raid" but with the echoey reverb of a cavern, the scratches of claws on stone and the shuddering crashes of Dragon wing and tail shattering the cave walls. Red Dragon Underground SoundSet © 2015 Paizo Inc. Paizo Inc., the Paizo golem logo, Pathfinder, and Pathfinder Adventure Path are trademarks of Paizo Inc. Sounds created under license with Paizo Inc.